The beauty of handmade gemstone rings is that each one is wire-wrapped individually, making each unique and one of a kind! Custom ring styles are also available upon request. An 8x15mm goldstone gem bead, resembling a treasure chest of shimmering gold, is hand wire-wrapped in 14 karat gold-fill wire in this handmade bead ring. Currently available in 6-1/2" only. Goldstone is often mistaken as a natural gemstone, when in fact, it is a man-made glass. Produced in a low-oxygen reducing atmosphere, the finished product is glass infused with glittering metal flecks which creates its' eye-catching sparkle. 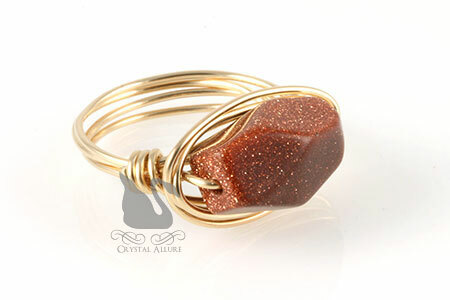 Goldstone is sometimes called 'stellaria' or 'sun sitara' (sitara means 'star') for its' starry internal reflections. The most common form of goldstone is reddish-brown which is usually referred to as 'brown goldstone'. Sun kissed goldstone beads shimmer in the sunlight with golden copper sparkles that punctuate the rich reddish-brown color. Wearing a handmade gemstone ring makes a wonderful conversation piece. 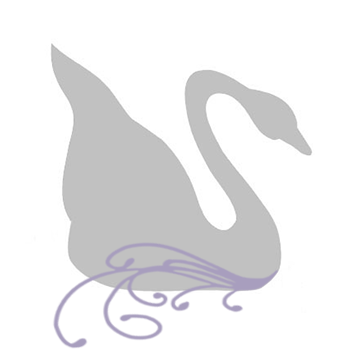 The beauty of gemstone is that it is naturally formed, making each one truly a one of a kind! 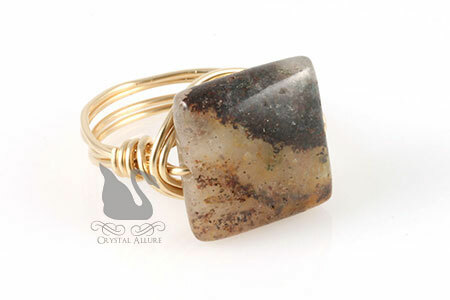 In the design above, a 15x15mm banded square jasper gemstone bead is hand wire-wrapped in 14 karat gold-fill wire for a beautiful autumn handmade bead ring. Currently available in 5-1/4" size only.